The contest finished at 2A.M. on the morning of the 25th. Daly is listed as the Irish Champion. Ross is listed as the Scottish Champion. Daly had complained through-out the first three falls of being fouled, when the referee would do nothing, Daly slugged him during the intermission between the third and fourth fall, the referee hit Daly back. Then a fight ensued which the police had to break up. The matchw as then ordered to continue with the same referee. The Mayor of Baltimore is said to have presented Miller with a "Large Gold Medal" following this victory. All information comes from an Australian paper later in the year. Was originally set to take place in Cincinatti, however, it was rearranged. Bauer dislocated his shoulder in second fall and could not continue for the third. William Muldoon is generally recognized as the Graeco-Roman champion during this time by historians. Bauer lost his temper and challeged Ross to rematch. Bauer is listed as the French Graeco-Roman Champion. Ross is listed as the World Mixed Style Champion. Attendance: "A Good Average Sunday Night Theatre Crowd"
It's said Bauer lost two teeth and Ross received a black eye. Bauer was declared to sick to compete before the bout but wrestled anyway. Following the second fall he was suffering chills and unable to stand. Ross claimed the stakes as a victory, however, he agreed to face Bauer again next Friday. This is a continuation of a match held on November 10 which is said to have been a draw, but Ross had walked away with the stakes. There had been a bit of rough business by both men during the match, Sorakichi forfeit before the fifth fall though stating a headbutt to the stomach made him feel sick. McGregor is noted as Canadian Champion. It is said that Ross had mortally wounded Jenning, with an "unfortunate slash of the sabre in the hands of Mr. Ross, which fractured the skull of his opponent, who was gashed by an ugly wound over the right ear." Both men had been wearing a helmet and other safety gear for such a contest. Ross declined to wrestle the fifth fall claiming to be sick. Sorakichi had won the coin toss to decide the style of the final fall. Sorakichi refused to wrestle the deciding bout. Ross had won the toss and chosen Collar & Elbow. The rules stipulated any style could be chosen if the coin had to be tossed. That resulted in a row starting and Sorakichi blackening the eye of an interfering bystander. The bout started 30 minutes late at 21:00. The audience threw money for the boxers. The third fall was decided by a coin toss. Muhler did not want to wrestle Collar & Elbow as he did not understand it. He had no choice as per the contract signed though. Following the bout an effort was made to raise a $50 purse for a Graeco-Roman bout between Ross & Muhler. They only achieved $23 and the idea was dropped. George put up a $50 forfeit for a match with Ross. Also features Sergeant Charles Welsh & Captain Lucien Gaston. Duncan C. Ross def. 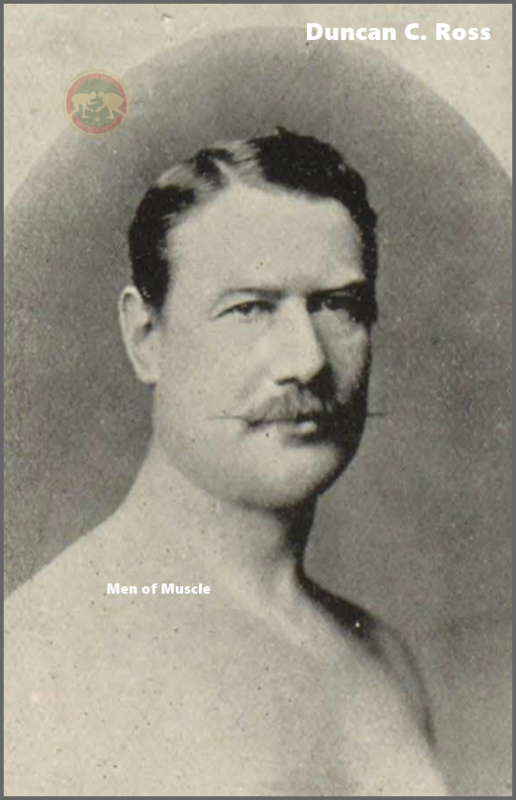 George Ross "the Cumberland Wrestler"
"Walsh was riding the horse at a furious rate and the spear with which he tried to remove the peg from the ground sank into the earth. The handle was carried forward and the point of the spear entered the horse's right side and came out of his back. Walsh had a narrow escape from injury by the spear." Events: Fencing on horseback in steel armor; Combat between a steel clad footman, armed with a gun and bayonet, and a sowrdsman, on horseback; wrestling; the hammer throw, 16lb; the shot throw; puttin the 56; tug of war; 100 yard foot race. Other than the first two events, all the events have prizes. Events for prizes are open to all competitors. Possibly July 18, but no later than July 21, 1888. Also featuring Serg't Walsh, Lt. C.C. McKinney, and many other local athletes. Other events include: Sword combats, foot races, putting the 56lb, the heavy stone, the caber, hammer throw, and etc. The show is postponed until July 21, 1888. The contest ended with both men looking to have a bare-fisted fight, but the police quickly stopped it. The nearest competitor was John A. M'Dougall with 99 feet. It was nearly 21:00 when the first bout started. Ross protested the decision on the grounds that the rules were not followed correctly. G.M. Ross and D.C. Ross are two separate men. Sometimes in England they were misprinted in newspapers. G.M. was from Scotland, so given then that this G.M. is from U.SA. I think it is actually D.C. Attendance: "Very Well Considering the Rain"
Only the middleweight (11 Stone & Under) wrestling could be held due to the weather. 1. Duncan C. Ross (111 feet, 10 inches). 2. A. M'Kechnie (79 feet, 6 inches). 1. Duncan C. Ross (41 feet, 4 inches). 2. W.J. Fre (39 feet, 6 inches). 3. A.M. M'Kechnie (39 feet, 4 inches). Dunn declined to face Ross in the latter match. The third matchwas made to please the audience due to Dunn's forfeiture. Dunn was listed as the Australasia Mixed Style Champion. Ross was listed as the American Mixed Style Champion. The audience was disorderly due to being kept waiting thirty minutes. He performed feats of strength in manipulating weights. Performed feasts with a saber; cutting through a piece of lead slung by loops of cord from the points of two other swords, cutting through a potato on the neck of a native without taking away any flesh. Other feats with the sword were carried out and were loudly applauded. Nobody accepted Ross's open challenge to wrestle him, so he called up two men by name. Permission could not be obtained to hold the match. Khalifa declined to wrestle in the Cumberland harness for the second fall and thus forfeited the fall. Feats of strength performed by Captain Duncan C. Ross & Gunner T. Nichol. Plus variety entertainment. John McMahon and J.C. Daly are listed as champion Irish wrestlers. Ross is listed as the champion wrestler and swordsman of the world. Green is listed ans the English Catch-as-Catch-Can Champion. Also featuring other variety entertainment. Also featured The Hanlons, marvellous aerial gymnasts as well as other variety entertainment. Belling is said to be the German Champion. Petrof is said to be the Bulgarian Champion. Green is listed as the Lancashire Champion. With a selection of the following troupe: Jassar Ismael, Turkish Imperial Wrestler; Mehmet Adalli, Turkish Imperial Wrestler; Antonio Pierri, the Terrible Greek; Charles Green, Lancashire; G.M. Ross, America; Boyer, Marseilles; Alphonso, Spain; Masson, Paris; Mastoc, Bordeaux; Paul Belling, Germany; and Petroff, Bulgaria. A selection of the following wrestlers will perform: Jass ismael, Turkish Imperial Wrestler; Mehmet Adalli, Turkish Imperial Wrestler; Antonio Pierri, the Terrible Greek; Charles Green, Lancashire; G.M. Ross, America; Boyer, Marseilles; Alphonso, Spain; Masson, Paris; Mastoc, Bordeaux; Paul Belling, Germany; Petrof, Bulgaria. The preliminary was to be performed by the American Burlesquers. Wittmer is listed as the Cincinnati Graeco-Roman Champion Wrestler. This match was said to get the greatest advance sales of any wrestling bout ever at the People's Theater.